Fungus eating is hardly a new idea in any part of the world. Some, like the Alba white truffle even cost top dollar (easily USD$1,000+ per pound in season), despite that it is essentially just a delicious dirt-covered fungus found by pigs and dogs. Cordyceps, as you've just seen in the video, are an unusual parasitic fungus that brain wash insects before growing out of their heads--I hope to never see the day where there is a human equivalent. These fungi are also eaten by humans. In China (it just had to be China), a certain type of cordyceps is prized for their medicinal properties. The Caterpillar Cordyceps (Cordyceps Sinensis), grown from the infested bodies of the moth caterpillar, was once only available to Chinese Royalty. But these days, you and everyone else can get your own little bottle of Caterpillar Cordyceps to ingest at home! The most prized of Caterpillar Codyceps are found wild on the Tibetan plateau and gained some international notoriety when two Chinese athletes beat three world records at a track and field competition in 1993. One of the main herb and food supplements they took to increase their stamina was Cordyceps. 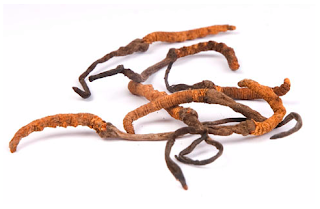 Considered an herb, Cordyceps supposedly enhances the immune system, strengthens the lungs against asthma, fortifies kidneys and increases "sexual vitality" (according to reputable Eu Yan Sang). Cordyceps can be ingested in pill form or double-boiled in water as a drink. Alternatively, you can create a meal out of it and double-boil Cordyceps with duck meat or chicken, Chinese wolfberries and red dates. -- A classic Chinese soup. For those who can understand Chinese and want to know more, you may find this video useful. In terms of parasites, I still like the worms that hatch in the snail and crawl through it to finish up in the eye-stalks of snails. They then pulsate in different colors so they can be spotted and then eaten by birds. Best part is the snail lives on and his eye-stalks grow back. That one takes the cake. But I guess nothing beats Bot Worms for cringe-worthiness, those suckers are human compatible. Sent you an email but uh, my mom just brought me Brands Essence of Chicken which now has cordyceps in it. The chinese pharmacy in Serangoon Gardens has giant jars of those cordyceps. The woman wouldn't let me take pictures the last time I was there. G.R.O.S.S. Reinforces my belief that there are people whose natural inclination is to immediately think, "Wonder what that tastes like?" regardless of situation. I grew up eating this stuff and remembered questioning my parents if this was a worm or not when having them in soups. I've seen it used on patients after chemo cooked with duck/chicken to boost immune systems. Last I checked the prices of the Tibetian Cordyceps was about $200 an ounce...probably more now. They are very tasty when eating them growing up. But I found others to be tasteless. Here is a book that I read a long time ago that may be of interest. I was at the herb shop today and looked up the prices for the Tibetian Cordyceps...$8,000 USD a pound! One or two of these things aren't going to help. You have to eat lots for it to work. To think that this stuff was so cheap that once upon a time my Mom gave it to her cat to eat. Cats have an affinity to this "mushroom" for some reason. They have a synthetic Cordycep but I never tried it. I remember when I was being treated after being found with salmonela on the intestines. My anti-biotics were on a regular dosage so I had to stop taking in food supplements canada.